Unless you've been living under a rock for the past couple of months, you'll have heard of Rimmel's new "Wake Me Up" foundation and all the buzz it's had in the beauty world. The foundation is cited as having a "light smooth texture, for natural 100% poreless coverage" that "eliminates signs of tiredness and lifts skin from fatigue". The foundation gave me a nice dewy glow, although I would (obviously) need to set it with powder as the dewiness was in fact verging on shiny. However, I think I would have to use powder all over my entire face for this one. I don't usually do this as I have quite dry skin and I find throughout the day, a lot of powder often makes my makeup flake a little. 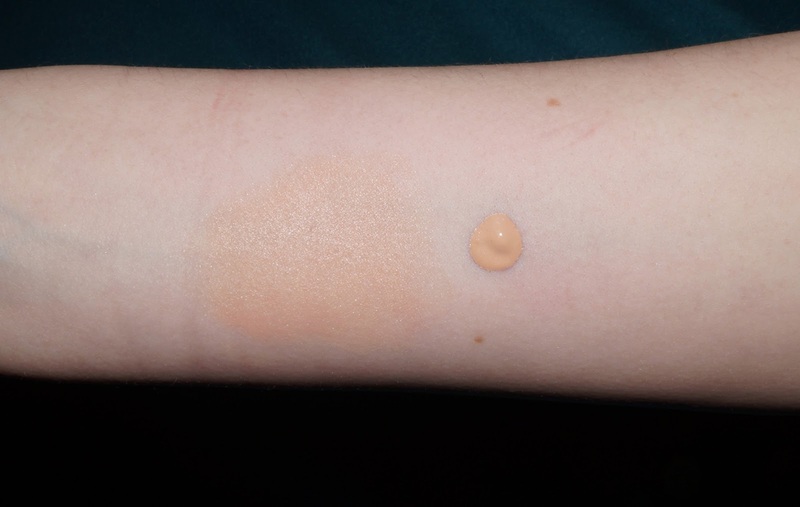 Below is a photograph of it on my skin as you can see the foundation is quite smooth (except around the sides of my nose/cheeks, but I have impossibly dry skin there so please excuse the scaliness!) and gives me a nice healthy glow. It doesn't appear to cling to hairs either, which is always a bonus as I don't want it highlighting my horribly unplucked brows - I'm trying to grow them out for reshape, the last time i had them waxed the beautician did them far too flat and thin! On to colour (the most important part for people like me!). I wore the colour "Ivory" as it was the palest in the collection and I find it incredibly hard to find a foundation that matches the colour on my face, as my skin there is incredibly white and kind of translucent (you pale girls will understand what i mean). As you can see the colour is a decent match for my skin, although I find in real life the foundation looks slightly like I have an orange-y film over my face. This is because the foundation leans quite yellow on my skin, which is slightly more pink based on my face. Below are some swatches of the foundation on my arm and face. As you can probably see, the foundation is by no means an exact match for my skin, but once blended out all over my skin it looks acceptable. I prefer to mix this with a paler, matte foundation and set with a light dusting of loose powder. I liked the coverage of this foundation, although it wasn't the best I've ever tried, it covered everything I wanted covered acceptably and definitely gave my skin a more "awake" look. This is 100% the best foundation Rimmel have ever come up with, and if this is a replacement for the old anti-fatigue foundation with the pink lid (does anyone remember this? I used to use it when I was about 13 - massive glitter flakes everywhere!!) then they've definitely hit the ball way out of the park with this one. The only real fault is the limited shade collection, but as a drugstore foundation this is to be expected I suppose!!! Curse you pale skin!! 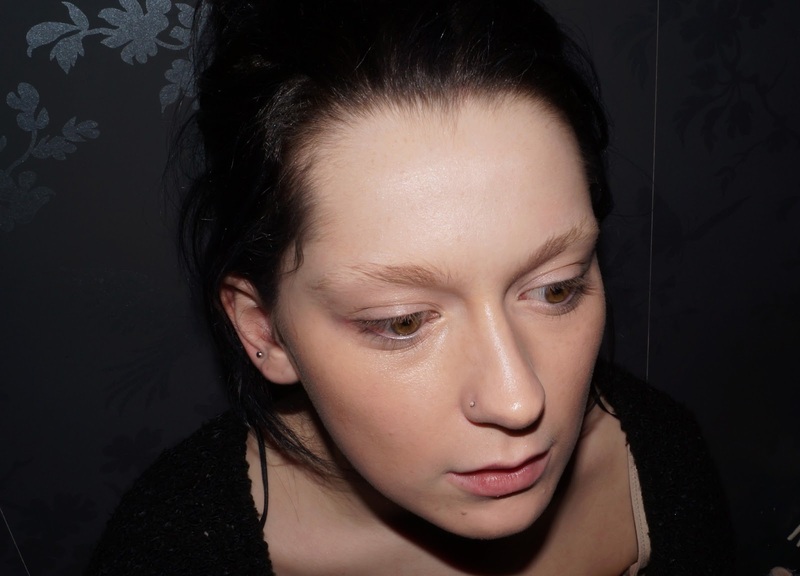 What did you think of Rimmel's 'Wake Me Up' foundation? Nice review! I've got really dry skin between my eyebrows and everything always clings to it making it look orange. I've tried the Bourgeois Healthy Mix as everyone raves about it but I find the coverage not great, so I this sounds better on that front. What concealer would you recommend? Thank you! Same! I have dry skin on my forehead and chin! I'm super pale so this does turn a little orange for me, but I find it looks awesome (really glowy without too much shimmer e.g. Revlon's Photoready!) and actually stays on your face a long time! Bourjois Healthy Mix has a super nice texture but I agree with you about the coverage, it's sooo sheer. It is quite buildable if you're open to layering and looks quite natural but does slip around and cake if you over-layer, I've found. llamasqua's skin base feels really nice and moisturizing, and Nivea's primer would probably help to combat dry patches! I would recommend the concealer that matches this foundation or Bourjois Healthy Mix serum for undereye circles, and MAC's Pro Longwear or Collection 200's Lasting Perfection! :) Thank you for the comment! Your blog is super cute by the way, loved the inspiring body image post! :) I have a tiny waist and chunky legs and shoulders and I feel your pain! Everything's made for super skinny girls with perky everything!